Take a walk with your Beth El friends around Duke's East Campus. Sign up here. Beth El and Trinity Avenue Presbyterian Church are co-sponsoring interfaith book discussions to provide our congregations with an opportunity to discuss novels whose themes highlight both Jewish and Christian values. The first book discussion will be on The Glad River by Will D. Campbell on Wednesday, May 15, at TAPC. The second reading group will discuss Dara Horn's All Other Nights on Wednesday, June 5 at 7:00 pm at TAPC. All participants are encouraged to read the books prior to the discussions. For more information or questions, contact Norma Gindes. Please register here in advance. Rabbi Greyber is offering a class to congregants of Beth El and TAPC to learn about the Passover Seder. Lifelong Learning Author Series, Dr. Marc Dollinger, "Black Power, Jewish Politics: Reinventing The Alliance In The 1960s"
A fun evening for those liking Jewish and almost Jewish humor. The evening will start with pizza and beer and clips (not chips) of some well-known purveyors of Jewish Shtick. This will be followed by 20 minutes of favorite Jewish jokes/stories volunteered from our MoB-bies at the event. Best joke gets a nice bottle of wine…worst joke gets a bottle of vintage Mogen David. The almost Jewish movie will be Monty Python’s THE LIFE OF BRIAN. This is a remarkable story of mistaken Messiah identity and the rise and fall of Brian Cohen (no relation to Eric) as king of the Jews, in spite of his mother. Please RSVP by April 4. If questions, contact Mike Resnick (michresnick@gmail.com) or Scott Smith (scott.m.smith100@gmail.com). Rabbi Michael Gisser is a former U.S. Army Chaplain and holds Masters Degrees in Marriage and Family Therapy, Religion and Educational Leadership and a Bachelor's degree in Management. He studied at the Institute for Traditional Judaism and completed his ordination at Kollel Ayshel Avraham in Spring Valley. He has served as the Executive Director of the Holocaust Museum and Study Center in Spring Valley, New York; as Associate Dean of Jewish Studies at the American Hebrew Academy; founding Jewish Chaplain at Wake Forest University, Director of Israel and Jewish Programs at Fairleigh Dickinson University, and adjunct faculty in the School of Education at UNC. He has also taught at High Point University in the Religion Department and is a frequent speaker at Jewish and Holocaust related events. Learning sessions led by Rachel Galanter, Elise Goldwasser and Elyzta HaLev. This session is open to anyone and will explore how language impacts our davening. 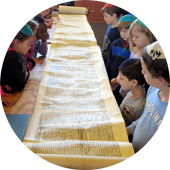 We will use materials from the Shaarei Zahav siddur and the Kohenet siddur. Email onesoilfarm@gmail.com to reserve a potted parsley plant ($5 each). Join this spirited, musical journey through elements of the Shabbat morning service. Sing, dance, and celebrate Shabbat in this intergenerational and family-friendly experience. Service followed by speakers Bruce and Susan Newman, who will share her father’s (Arnold Kay) story of survival. View our Sisterhood Gift Shop Catalog here! Beth El's renovation began in January 2018. You can find our office staff next door at the Freedman Center. Many of our services are being held at the Trinity Avenue Presbyterian Church (927 W Trinity Ave. in Durham). If you have questions about specific services and programs, please call 919-682-1238 or email info@betheldurham.org.